I wrote this basic guide on organizing pictures for those, who occasionally take pictures with digital cameras and who are looking for ways to organize images on their computers. This is NOT a guide for serious photographers with large catalogs of photographs. If you are a photographer looking for ways to organize your photo library, please see my “how to organize pictures in Lightroom” guide written specifically for serious photography work. During the last 10 years, all kinds of digital cameras have flooded both traditional and online stores. Today, the market is over-saturated with a wide array of digital cameras for personal and professional use and tough competition among the manufacturers pushed the prices so low, that most US households now own one or more digital cameras. Digital cameras have gotten so popular, that they made their way into our phones and other electronic devices as well. With such a wide array of sources where pictures come from, how do we keep them organized? Most people do not even bother organizing pictures. They take pictures, leave them on their cameras and mobile devices and use them when needed – to share a picture via Facebook or to send the latest pic to their friends and family. As a result, many pictures get lost and memories are gone forever. So, what should you do to keep your pictures organized and saved? Start with your computer and try to locate every single picture. Common places to look for photographs are in your “My Documents” or “My Pictures” folders, but you might have pictures in other folders as well. Just search your computer for all files with “JPG” extension and see what it finds. 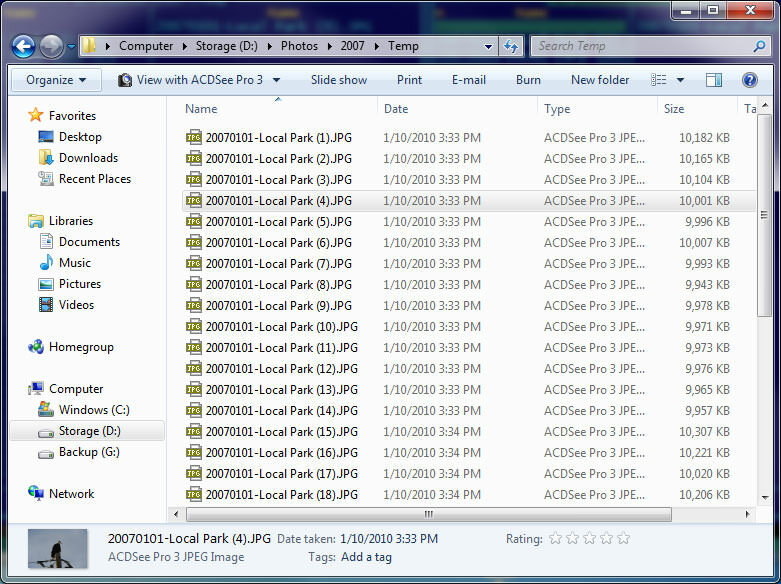 Create a local folder on your desktop and move all your pictures there. If you have other computers/laptops at home, perform the same search and try to find every single picture. 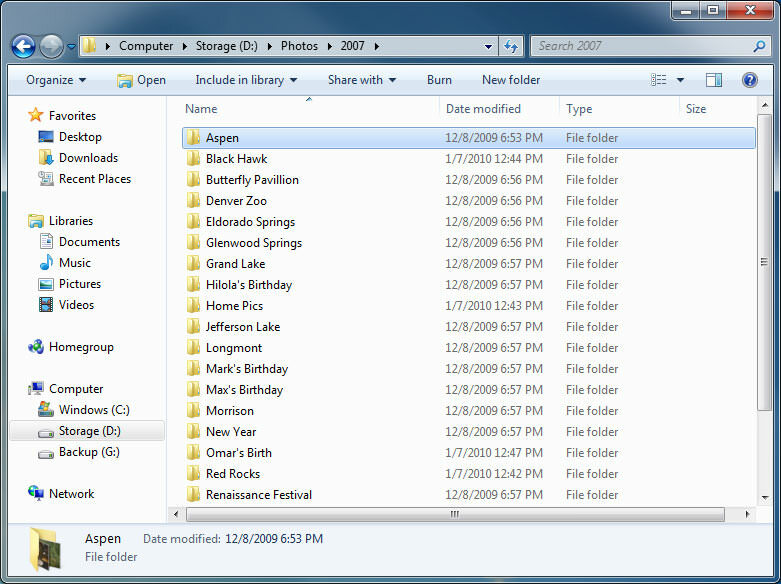 Next, go through your mobile devices (iPhone, iPod, Zune, etc) and see if you have any pictures stored there too. Copy them all to your main PC, into the same folder that you created earlier. Now it is time to look for your pictures on the Internet. Log into your email account and search for all emails with image attachments. Extract whatever you can find and save them to the same location. Next, go to all social media sites that you participate in (Facebook, My Space, Twitter, etc) and look for other pictures there. You might find your pictures in your friends’ albums too. Request your friends to send the high-resolution versions of the photos to you. Try to remember if any of your friends took your photos on their cameras and if they did, give them a call or email them and request them to send the high-resolution versions of your photographs. 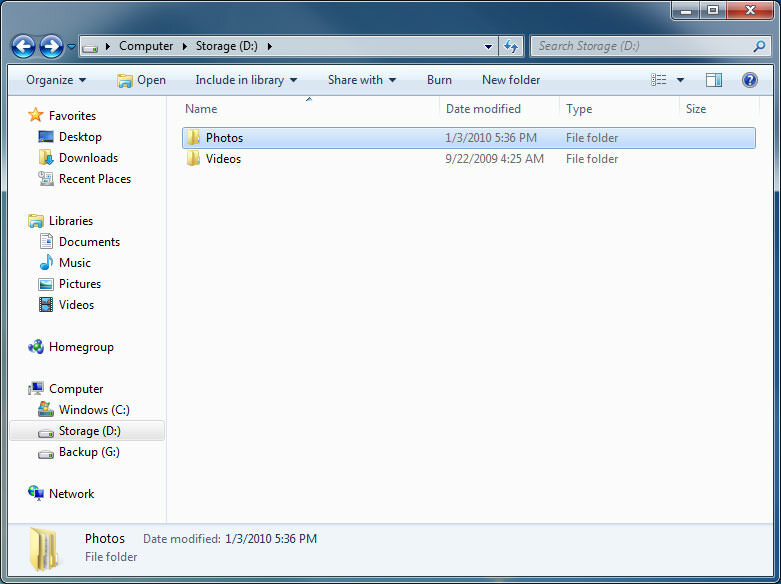 Save all new photos to the same temporary folder that you created on your desktop. Before thinking about how to organize your images, think about where you will be storing your images and how you will be backing them up. 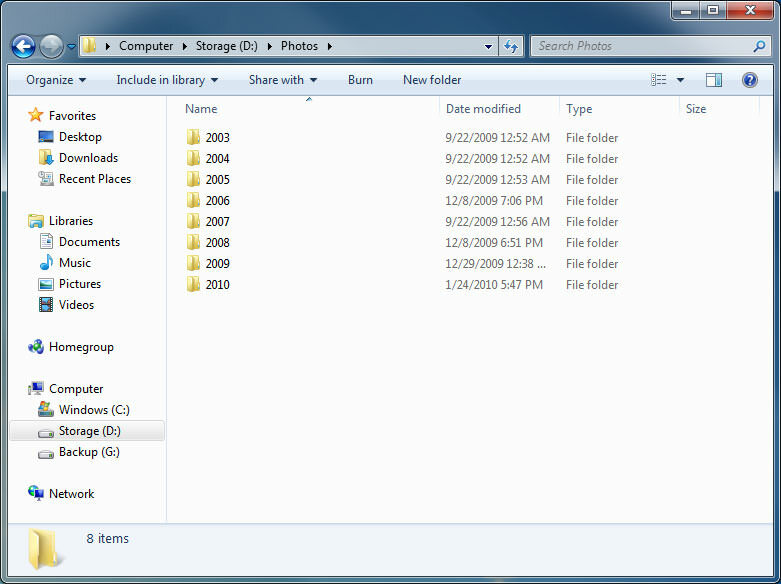 Some people like to store pictures on external drives and other storage media, but I store all of my photographs in my computer’s second internal drive (the first one is for the operating system). Internal hard drives are very inexpensive nowadays and you can buy a very large drive of 1 Terabytes or more for less than $100. If you have a laptop, it is probably better to store your pictures on an external drive instead, because the internal drives on laptops are typically small and slow. 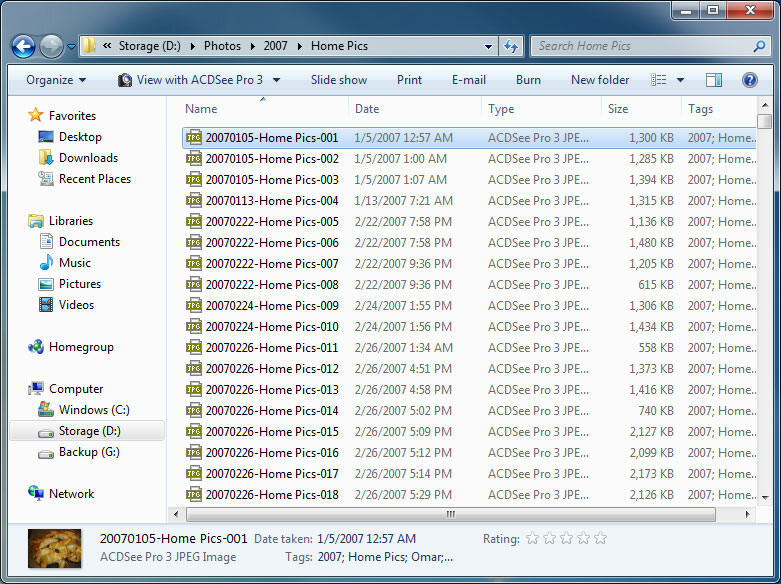 If you have a small number of pictures (less than 1,000), you can easily store them on your computer’s main drive. On the other hand, if you have a large collection of photos, then I would recommend to put them on a separate hard drive. No matter where you store your pictures, the first thing you need to think about is how you will be backing up your images. NEVER fully rely on a single storage space, whether a hard drive, a CD/DVD or a memory stick. All electronic equipment fails at some point of time and leaving your precious data in one place is like putting all of your eggs in one basket. So, no matter where you decide to store your pictures, decide where you will be backing them up at the same time. Do NOT make the mistake of backing up your data into the same medium. The backup must be on a different physical device, otherwise, it is not a real backup. For backup purposes, I use a dedicated external drive that has exactly the same folder structure as my internal drive – it is basically a “Mirror” of my internal drive. Examples of events are: “Mom’s Birthday Party”, “Christmas Celebration”, etc. – whatever fits the description of an event. If you have one large event that has smaller sub-events, then create one main folder and smaller subfolders underneath. For example, if you have something like “California Vacation”, it could have several subfolders inside such as “Disneyland”, “Universal Studios”, etc. Go ahead and create events for one year based on what you have. Look at the “Origin->Date” field for the date when the picture was taken. Other information such as “Camera” might be useful to determine who took the picture (whether it was your camera or somebody else’s). Move all of your photos into appropriate event folders and make sure that nothing is left in your original temporary folder that you created in your desktop. 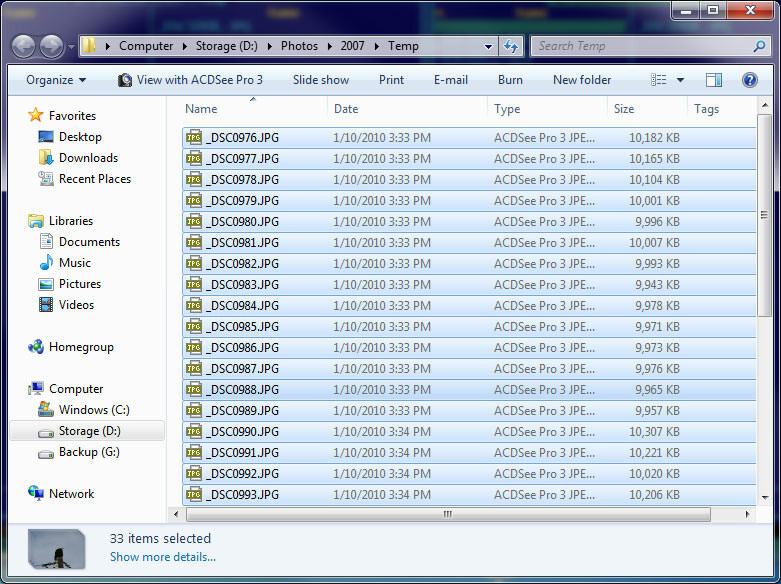 Unfortunately, many cameras produce images with weird filenames like “DSC1005.JPG” that do not make any sense. I highly recommend to rename all of your images to make it easier for you to locate them by searching for the file names in the future. Again, you can do this in many different ways, but I will show you the easiest method. Do not worry if something got messed up. You can go back to what it was by simply by going to “Edit”->”Undo Rename” or hitting “CTRL+Z”. You can also rename the files multiple times, if needed. Repeat this process as many times as you have folders and make sure that everything is properly renamed. Now that you have everything organized and renamed, it is now time to back up your data. Since you are just storing bare files, there is no need for some special backup program. All you need to do is to copy your files from the current location to a different one. Just go back to your main folder, select your “Photos” folder, right click on it, select “Copy”, then go to your destination drive’s main folder, right click on an empty area and select “Paste”. This should start the process of copying pictures from one hard drive to another. How often should you be backing up? I suggest backing up every time you add more photographs or when you work on your pictures. I personally try to do it every time I upload new photos from my camera and I highly recommend that you do the same. Unfortunately, most people do not recognize the value of backups until their equipment fails. I once lost two weeks of my photography just because I forgot to backup my photos! Lesson learned, now I try to backup as often as I can and I store my images in four different locations – I do not want to ever lose my data again. I have already spent about 5-7 hours to sort them out. Deleted thousands of photos. Created dozens of folders. Still plenty to do. Shams, don’t rush yet, I’m almost finishing up my next article on how to organize photos in Lightroom. I highly recommend doing it in Lightroom instead, especially if you have a large number of photos. I am about to embark on deleting photos and reorganizing, with the system of years, dates and subjects described above. How do I do a simple search in Windows 10 to find a particular picture once this is completed? I prefer using folder names as yyyymmdd_location_event i.e. 20071125_London_River_Walk naming individual photos is far to time consuming. Peter, you do not need to individually name each photo. You simply select all pictures (CTRL+A) then you press “F2” and rename all pictures to your liking. Your article on organizing photos in lightroom is the best I have found. Thank you, thank you, thank you. I have a question regarding renaming existing photos. I am using a mac and it won’t allow me to Ctrl+A and then change the name. I tried F2, I can’t find a rename function, and I have tried double clicking on it. Any suggestions? Hilton, you are most welcome! Try going to the Library module, then select images with your keyboard/mouse, then go to Library -> Rename Photos to rename all images. I only need a simple photo organizer and the Lightroom 3 software is too much for me. I like the process you described above. What software is that? I do have a lot of photos now being poorly organized through Picasa. Can you recommend an easy solution without using the heavy duty Lighteoom software? Thanks. I know it’s a little late, and please don’t quote me on this, but I think he is using the File Explorer from a windows operating system. Just found this article on organizing photos and it was extremely helpful and easy to follow. Now my photos are properly characterized and renamed. Thank you so very much for the helpful tips! Great work putting everything together in one neat article. Most of the steps you present here I have already done myself, however, there was one I never even heard of or thought about trying. That select-all and rename thingy… so much win! This is the first photography blog in MONTHS that’s actually interesting enough to follow! Sorry for the length of this posting, automated software recommendations to solve the problem of using multiple digital cameras but keeping files in FILE NAME and CHRONOLOGICAL order are listed at the end…. I have been shooting photos since about 1976. In addition to shooting with DSLR’s starting with digital Point and Shoot cameras in about 2001, I still shoot, develop, and print B&W film up to 4×5 inches, making prints up to 16×20 inches in my traditional wet darkroom. I cannot believe that just this week I found a solution for this digital photo file naming problem (found it on Google Play by accident of all places) considering all the photo web-sites I visit daily like DPReview, APUG (Analogue Photo User Group), Ken Rockwell, Thom Hogan; the photo magazines I subscribe to, and the technology web-sites like Cnet.com I routinely visit, and have never seen this discussed. Perhaps photographers are aware of the solution because they use different software. I do not use Adobe’s Light Room or similar Software as when I tried it several years ago, after having started a similar sub-directory by DATE/SUBJECT many years ago and already had thousands of images, I did not like what I called the “virtual cataloging” concept. I prefer the physical organizing of my files, and I had too many images to start over. I have been using ThumbsPlus by Cerious Software for over 10 years to manage my digital photo collection. I too started using the sub-directory structure you outlined back in the DOS days for data files, and kept using it for digital photos. However, when shooting with multiple DLSRs at an event (one with a wide-zoom, the other with a tele-zoom)and sometimes a Smartphone, I would make a DATE SUBJECT sub-directory, then below that one. create a sub-directory for each of the three cameras. If I put the photos into one sub-directory they would be out of NAME sequence as each camera is “counting” its own photos, thus not being in numerical order when placed together. If sorted by FILE DATE they would be in order for awhile…but after editing them, the new FILE DATES would get them out of order also. I am not going back to rename all my old digital photos as I would lose the part of the file name that contains the information regarding which editor/effect/corrections were used, as well as other things like the name of locations/people/category etc., that I included in those older file names. I am using this method, starting this week for all new digital photos. Thanks for the tip but I don’t have an option to rename files when I have selected them all and clicked right button :( Could you help please, I use Mac. you can look for batch file rename tools – either in Apple’s own app store, or else, just google for ‘ batch rename ‘. For mac OSX There’s also graphicconverter you can use quickly rename all photo file names. Backup prices have dropped enormously. You can now have a 1TB backup in the cloud (which means multiple backup drives) with services of Dropbox.com, Box.Net, apple’s iCloud (50GB), and Amazon S3. It might be worth checking these out as well, since you always have an extra backup then. Regarding organization, when an event includes both video and photos files, what is the best organizational structure? I considered putting both in the same event folder, but perhaps if I were to use Lightroom to catalog both type of assets, it will not matter about the physical storage location. I would appreciate any suggestions and thoughts on this topic. I’ve seen other guides suggest organizing folders as [Year > Month > Day] or just [Year > Month], but I like your idea of [Year > Event] much better. It’s more intuitively descriptive and doesn’t split related photos across multiple days, yet it doesn’t leave me with ever-multiplying folders in the root of my Pictures folder. Thanks for the idea! Nice article. Thanks for the great information! Should you have a separate folder for family pics? Nashim, your article is very helpful. Can you recommend a method or a program with which I can “tag” a picture to enable searching. e.g. On 2015 March 5, I have taken a picture with my family in Switzerland with great sceneries. I wouldn’t want to physically make four folders, “2015 March”, “Places”, “Family”, “Sceneries” and then make four copies of the same picture. It’d be good if I can apply 4 tags/labels to that one picture and then be able to search it later on. What I AM looking for is some that can offer “understanding and advise” . Especially if they have “BEEN-THERE-DONE-THAT” AND OVER-COME!!! This post took off to the South and is not what i expected to wright and i hope it won’t be used against me in the Profesional Photog World. Like don’t blast me on social media in a way that would hurt my future. FIGURES!!!! I finely take a chance and open up and after rereading I see that I probably put that post out of place… I wish I could take it off of here!!! Is there an option for that??? …and that was supposed to be WRITE, not WRIGHT up there! Omg this is so helpful. I am somewhat between OCD and normal people. A lazy perfectionist (haha) and been lookin on the internet about idea on how to organize my photos (not the APP to organize it). And your article gave me inspiration. Thanks! I’m inspired! Thanks for the easy to understand article! Thank you for your post. I was overwhelmed with photos, so this is extremely helpful! Each folder of my Nikon camera is limited to 9,999 images. 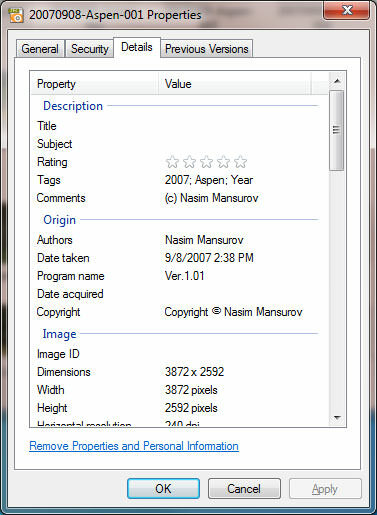 To avoid duplicating the filename(s) by using the default setting when I reach image 10, 000 or greater (requiring a new folder) or change to a new Nikon camera (as I have done twice) I name my files as yPN_xxxx where y represents the folder number, PN represents my initials, and xxxx represents the image number within a folder. Organization (and photo workflow) starts with the process of naming the image in the first place. This is not my idea; I read it somewhere. But it seems to make sense — whatever software is being used for transfer, storage or post-processing. Thank you very much for this very well explained article. Lot to do but now you have given me the lead I feel it “might”, be a bit more straight forward. Could I ask if you might recommend a simple straight forward program for photo organisation. Not really into all the touching up etc. I used to use Picasa which, as you will know, Google has now “Killed off”. I don’t really want the new Google setup. To be honest, I don’t trust google I believe they collect all data they can, I try to do everything to avoid them Reading, copying and using my data. Just found this site and have to say I have been missing out. In addition, versioning is essential. Without version control we might have a chance to publish the wrong image. Version control can prevent lots of potentially costly mistakes. 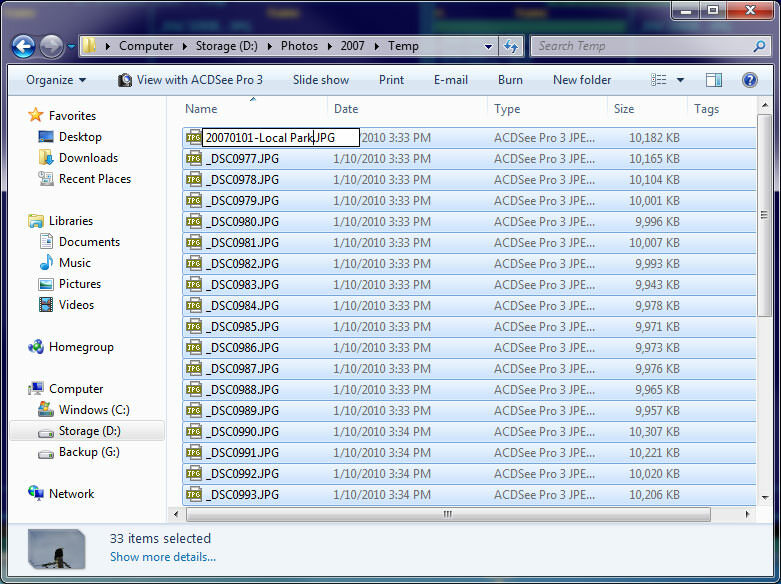 I must admit that I am guilty of not renaming pictures, I have however found a way around it by creating folders. I used to that just on my computer but since I discover DBGallery, I have always resorted to using them. It is quite easy. After signing up on their website, you can create different folders for different events and upload pictures to those folders. You can visit them on DBGallery.com to learn more. In the age of technology, electronic storage has become just as much of a dilemma as physical storage. We take our family pictures using our digital cameras, download the pics to our computers. In my opinion, the organization of photos could go further. You could build the photo organization on two pillars. Pillar 1 would be a well-designed folder structure as described very nicely above. Pillar 2 could be the use of tags. Tags allow users to search or filter photos regardless of folder structure. Tags are supported by default in Windows AND are also found through the search function. How to tag photos can be found in many posts (example: www.groovypost.com/howto…indows-10/). The problem with that is that it is very time consuming, but here too there are appropriate tools to help you with this (example: www.tagyour.photos/en/). I do not think that one way or the other is the right one. I think the combination of both ways brings the best results.